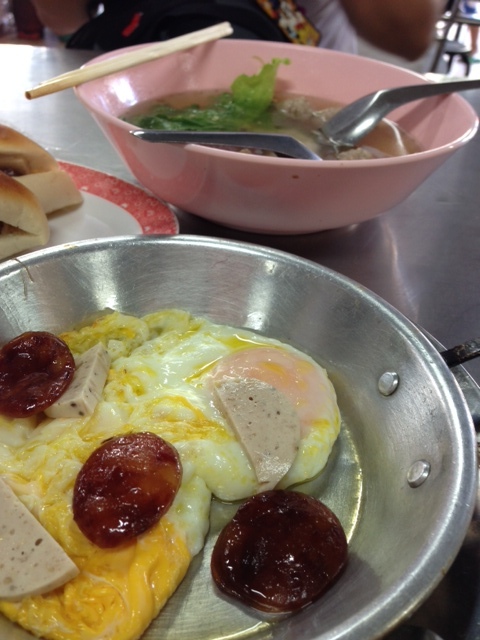 There is nothing easier to make in all of Thai street food than kai kata, or “egg in a pan”. Still stinging from our inability to decode Jay Fai’s Byzantine fusion of herbs and spices masquerading as tom yum goong, Chris and I decided to give ourselves a break and do something that is, quite literally, fool-proof. There are no rules for this fusion-y adaptation of a Western favorite. Ironically, if you are in the West, you may need to make some substitutions for some hard-to-find ingredients, so you may have to re-substitute those substitutions. Hence our choice to use buttered ceramic ramekins instead of tiny pans, because we aren’t sure how many of those are available back West. If you don’t have an oven, you can make a bain-marie by putting your ramekins in a pan, filling with water up to the middle of the ramekin, and cooking your eggs on the stovetop. However you decide to make it, we have tried to cleave as closely to the “authentic” (circa 2013) basic Isaan-style kai kata as possible. 1. Preheat oven to 325 degrees Fahrenheit/180 degrees Celsius. 2. Place buns, slightly open and their insides buttered, into a casserole and toast in the oven until warm, edges are light brown and butter is melted. 3. In a pan, warm slices of Chinese sausage and/or moo yaw until hot to the touch. 4. Crack 1-2 eggs into each buttered ramekin, depending on size. Cook in oven for 5-10 minutes (depending on how well your oven works), until whites are set when you jiggle them and start to pull away slightly from the sides of the ramekin. If you like your eggs more well done (I love runny yolks), wait at least 10 minutes. 5. 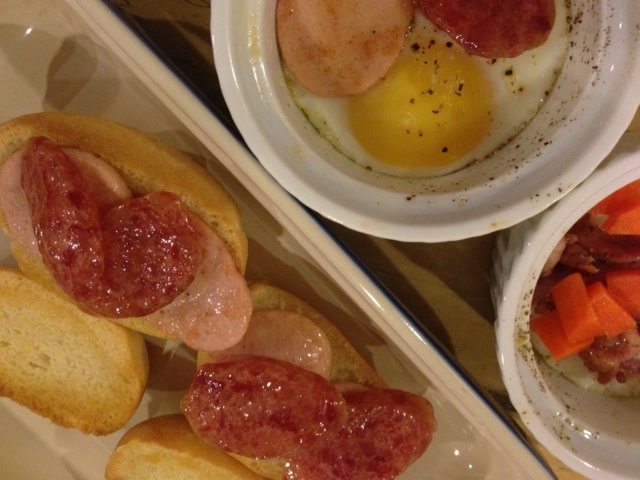 Take eggs out of oven and garnish with sausages and “ham”. If you have cooked minced meat and/or vegetables, scatter those onto your eggs as well. Season with salt and pepper. 6. Fill toasted buns with slices of “ham” and “sausages”. 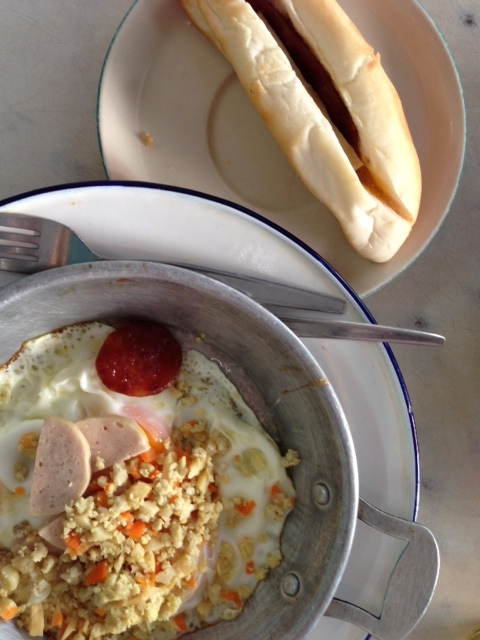 Serve alongside eggs, and make sure to pass the fish sauce/Maggi and sweet chili sauce. Easy AND delicious.